The two solo jets join the other four to form the delta formation and perform maneuvers together. 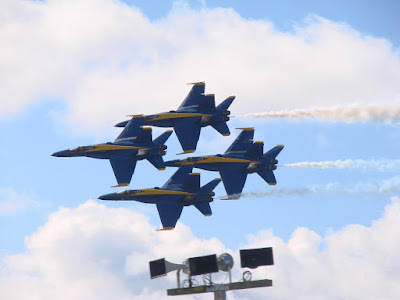 Initially called the Navy Flight Exhibition Team the squadron was redesignated the United States Navy Flight Demonstration Squadron in 1974 and adopted the name Blue Angels in 1946 when one of them came across the name of New Yorks City’s Blue Angel nightclub in the New Yorker Magazine. This years pilots are CDR Greg McWherter, LT Jim Tomaszeski, LT Rob Kurrle, Maj Christopher Collins, LCDR Frank Weisser and LT Ben Walborn. Here is a shot of the Blue Angels speeding into the wild blue yonder. The Blue Angels fly using the Boeing F/A-18 Hornet which is a dual-role fighter/attach aircraft. They have been using it since 1986. Prior to that they used the McDonnell Douglas A-4F Skyhawk II. The Hornet can reach speeds of 1,200 mph (Mach 1.7+) and are powered by two GE F404-GE400 low bypass, turbofan engines each capable of 16K-pound thrust. They can fly up to 50,000 feet and carry up to 56,000 pounds. Each of these planes cost around $18 million to produce. 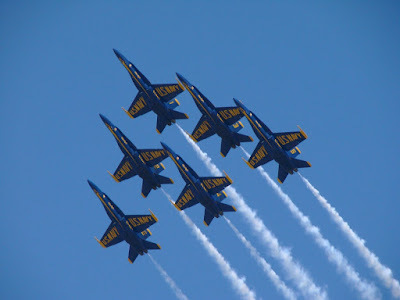 Here is the classic Blue Angel tight diamond formation. In this formation usually at lower speeds they performed maneuvers such as formation loops, barrel rolls and various other transitions. The most amazing thing is how close the 4 planes are to each other. The speakers you see below were used to let the crowd know what formation was coming up. It also give you an idea of how low they were flying. 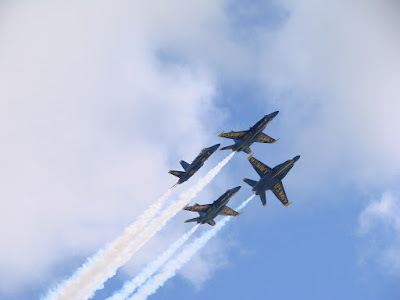 In 2009 more than 8 million spectators came out to watch the blue Angels and since their formation in 1946 , the Blue Angels have performed in front of more than 463 million fans.